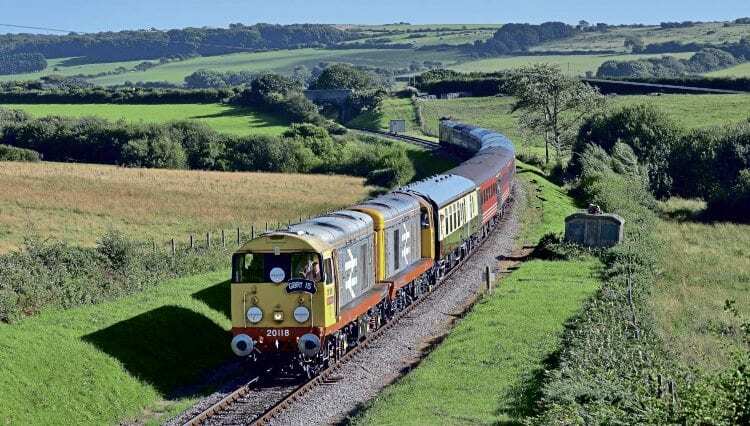 NINETEEN locomotives and 2,220 miles covered over four days made it GBRf Charity Railtours best-ever fundraiser. The five-legged charter, ostensibly celebrating 15 years of the TOC, raised more than £125,000 for charity. The company’s new celebrity BR green-liveried ‘66’ No. 66779 Evening Star (with matching chocolate & cream ‘support’ coach!) was the appropriate motive power to bring the curtain down on the September 8-11 marathon at Paddington station’s platform 1 bufferstops, amid jubilation from dedicated volunteers and passengers. All train crews donated their time to the event without pay. ‘GBRf 15’ set off from London Victoria behind a pair of Class 20s (Nos. 20118 Saltburn-by-the Sea and 20132 Barrow Hill Depot) to Fratton via Wimbledon and Horsham, backed up by a duo of Class 73/1s: Nos. 73128 OVS Bullied CBE and 73213 Rhodalyn T&T.